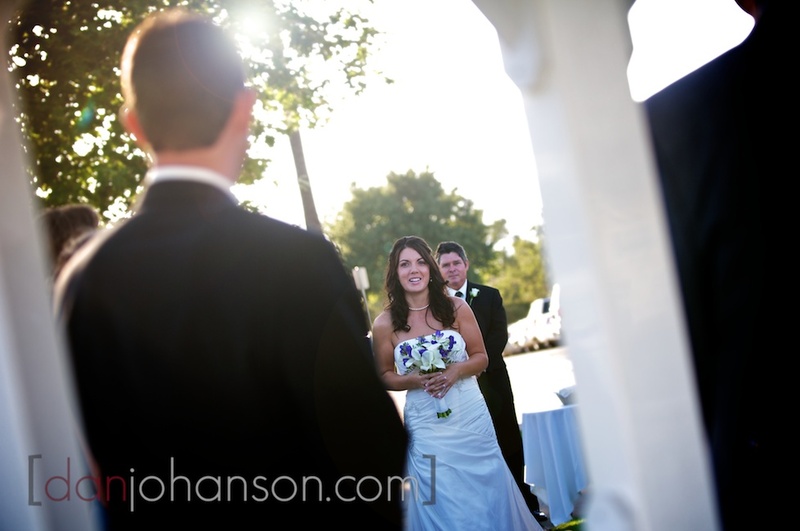 Steve and Shannon's Wedding at Eagle Ridge Country Club in Gilroy was a blast. First off though, a quick word about the venue, which was really great in many respects but lacking in a few. Let's start with the good things about it -- The ceremony setup is just off the golf course and right next to the club where the reception hall is located. So there's no long walks and no place really for people to get lost. This is important when taking the formal pictures and some venues make it impossible to find people who have wondered off. In the afternoon sun, there isn't any backlight to deal with because the sun sets behind where people sit and the light on the bride and groom is just perfect, so long as it's not a mid-day wedding. The only tricky shot here though is getting the bride walking down the isle and getting her exposed correctly with the sun right behind her can be a challenge. Eagle Ridge is very picky about not stepping on their golf course. The event manager there told me that the G.M. has been known to go ballistic if he sees anyone doing this for wedding portraits, so I was warned not to bend their rules in the slightest way. Fair enough and there are indeed enough other places to do portraits. The reception hall is fairly typical and the staff are on top of their game. All my needs were taken care of efficiently (though we're only talking about a request for a table and chair for my slideshow presentation). They do have an LCD projector, so that was nice that I didn't have to break out my own equipment. Slideshows of ceremony highlights are always a big hit and make for a great lead-in to the program after dinner. Well thanks Steve and Shannon for a great day. You guys know how to party! Your wedding at Gilroy Eagle Ridge was awesome and I'm so pleased you are happy with your wedding photography!